The Broncos have their backs against the wall, after back to back dire performances. For Wests, they have to kick their goals between the posts, which has let them down twice this season. A lot of calls about a soft forward back for Brisbane should rile them up, but another lacklustre performance could be curtains. Tigers need to target the halves in attack, run at Milford and Nikorima, and put pressure on Boyd with kicks too. The Titans are staring down the barrel of another poor season. It gets no easier against the Panthers who have won their last two starts. Too many mistakes are hindering the Titans on attack, and they look disinterested on D.
The Panthers are switching DWZ and Edwards positionally, but they’re still two both very good players regardless of where they play. I think the Titans will do better, but still not good enough to beat the Panthers. The Cowboys are another Queensland based side in all sorts of trouble. No go forward, and no flair on attack. They’re all trying too hard, and things aren’t coming naturally. The Storm have been very impressive, and will look to continue their unbeaten run. North Queensland will have to really stand up to upset the Storm here, but I just can’t see it. Wayne Bennett will have riled up the troops after a sloppy loss last week, and the Rabbitohs will come out firing. The Warriors haven’t had a close game yet, so expect it to be a wild 13+ win, or 13+ loss. The changes made aren’t too significant on each team, so there the combinations will be formed and ready to battle. On the Sunshine Coast is this match, and I think the Rabbitohs are just too good for the Warriors. More consistent. Three straight losses for the Knights against a Manly side with two straight wins. I feel that Newcastle have been unlucky in their last two games, and are not far off putting on a good victory. The Sea Eagles lose their very influential fullback who has done so well in his two games this year. With Newcastle at home, I think they’ll put in a good enough performance to win. They’re a solid side. They can match Manly up front and get a good platform. Ponga at fullback also helps. Cronulla didn’t quite look themselves last week, but they’re a strong team who will be up for this big challenge. Both sides are almost full strength, which makes this game even better. Cronulla are playing at their newly named stadium for the first time since the deal was made last week. Is there any stopping the Roosters? Potentially, but the Sharks have to play smarter, and not get sucked in to the middle third of the field where the Roosters dominate. Two tight wins will restore the confidence of the Red V.
Canterbury have improved by miles over the last fortnight, but still lack the killer instinct. 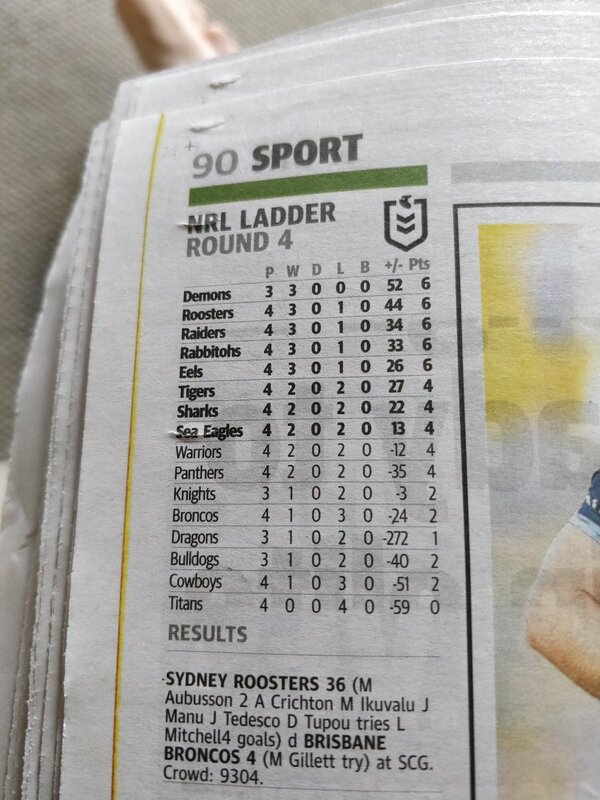 I actually see this being another close game for the Dragons, potentially a third one point game in a row. Lots of improvement left in both these sides, but the Dragons look a bit fitter and sharper. Their organisation on field will lift them to a third straight win. Potentially the game of the round. There’s no real headlines being made about these two sides who are both 3-1. The Raiders at home are always tough, and they’ve got a bit more grit and steel about them in 2019. Parramatta have more flair, and more ability on attack when pressuring teams which has improved their game significantly. A real close one this, two very strong teams going at it. Not much separates them on paper.